Ninja Assault is the latest light-gun game by Namco that plays like a bad 1980's action movie. The game is set in some bizarre area of feudal Japan that apparently had science fiction robot's and Samurai's running around. You play the role of a Ninja who has been assigned the task of rescuing a beautiful princess from an insidious and evil entity. Fortunately for you and your team, you have also been equipped with hand guns. Ninja Assault contains seven different stages that range from mysterious forests to the feudal style castles of ancient Japan that will eventually lead you to the confrontation with the end boss. As with all light-gun games, you will have the game finished within 30 minutes if you're good enough, maybe even less with another player. The gameplay behind Ninja Assault is quite straight forward as it's basically a point and shoot game, provided you have a G-Con 2. Ninja Assault also works with a Sony DualShock controller that is quite easy to use because of the auto-target feature that is built into the game. 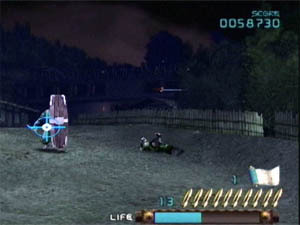 As soon as a target appears on the screen, you must shoot the enemy in order to survive. Once your gun is out of ammunition, you must reload it in order to shoot again. 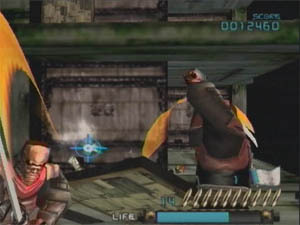 Fortunately the game contains various bonuses hidden around the levels such as super weapons that work for a limited time only and is great for clearing the screen of enemies. The enemies in the game contain a variety of weapons such as Samurai swords, shurikens and crossbows. 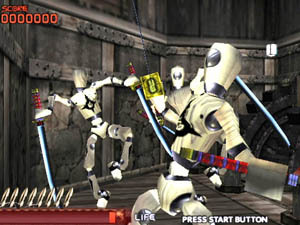 There are a variety of different enemies in the game that range from the traditional Ninja and Samurai to futuristic robots and spider creatures. Ninja Assault also contains a variety of unique bosses that are actually quite easy to defeat when compared to your standard enemies. Graphically Ninja Assault is a very dated game and is a straight port from the arcade version. Unfortunately because of this aspect, the power of the PlayStation 2 isn't used at all and all the characters are made up of low polygon counts that contain basic texture details. This makes the enemies look quite unappealing, flat and rather boring. Even the backgrounds in the game are quite dull when compared to the current day light-gun titles. The sound effects of Ninja Assault are fairly basic and shows how limited the original arcade version was. The sound effects also become quite repetitive after awhile. The voice acting in the game seems forced and very cheesy but it actually suits the game very well. Musically, Ninja Assault sounds a Japanese pop song that has somehow found its way into a Hollywood B movie. 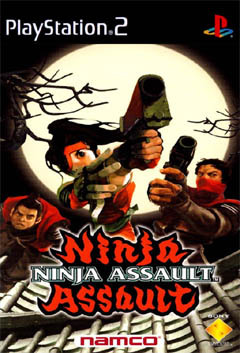 Ninja Assault, isn't a bad game, its just that it's in the wrong era of the PlayStation 2 games market. Perhaps if it was released a few years ago, it would have been a better impact but unfortunately, gems like this should have remained hidden in the ground. Be careful, be very careful.